From January 7-8, the Wine To Water team took to the beautiful mountains of Tennessee for our 9th annual Cross Training event. This two-day conference is held twice a year, where employees gather to strengthen the bond of our community and our organization’s ability to make real change. To kick off the event, Volunteer Program Coordinator Emily Hendrickson introduced the idea of a brave space. By acknowledging that there can never be an entirely “safe” space, the team was freed to be courageous and open about their thoughts, experiences and feelings. Through training sessions, team-building activities and the sharing of personal stories, Wine To Water readily accepted the invitation into a brave space for the purpose of exploring our Cross Training theme of legacy. What should be the legacy of Wine To Water? The simplest answer would be clean water, of course. But as an organization that strives to go deep in everything we do, there is so much more to our legacy than water alone. To truly know the legacy of Wine To Water, our team needed to understand where we’ve been, where we are now and where we still need to go in our mission to support life and dignity for all. 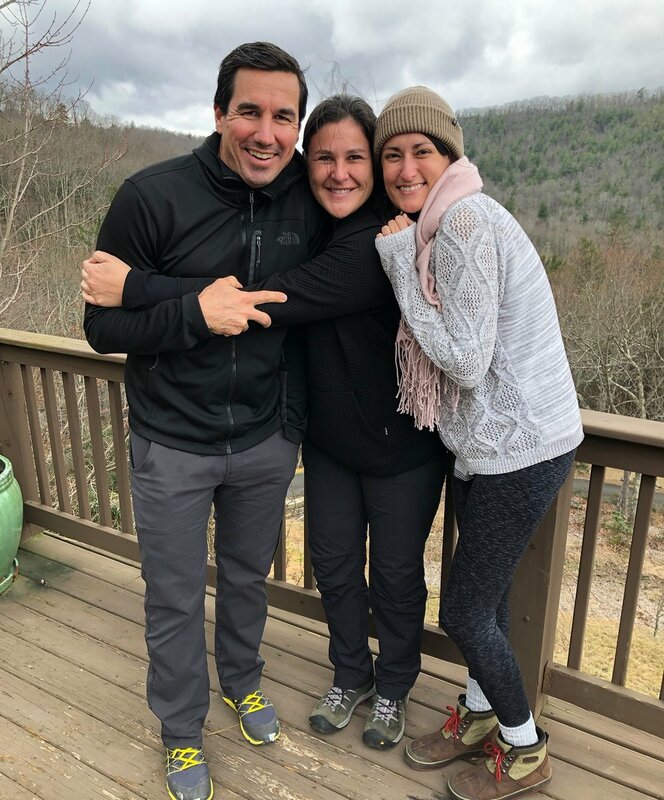 (From left) David Cuthbert, Lisa Merritt and Emily Hendrickson bundle up in the cool Tennessee mountains! Many sessions were lead throughout Cross Training, varying from professional to personal focuses. Founder Doc Hendley joined the team in discussion of his book Wine To Water, revisiting the inspiring journey that brought our organization to where it is today. CEO David Cuthbert shared tips on setting goals that allow you to follow your purpose, while Director of Fund Development Tina Owen reminded us of our core values to build community, allow empowerment, go deep and create lasting change. Staff members also explored possible team dysfunctions, their Enneagram personality types and how we could all contribute to the continuous story of Wine To Water. Throughout many of these sessions, employees were paired into groups for discussions or activities. One activity in particular - titled “Bird Box” - was invented by Finance Director Katy Cook and Donor Relations Coordinator Courtney Mattar. Teams of four were each given a box and list of items to find in a grand, outdoor scavenger hunt. However, only one team member could use all of their senses, while one had to be blindfolded, another could not speak, and the last could not use their hands. Some teams quickly figured out systems that would lead to success, while others struggled or were simply having too much fun to focus on the task at hand. Regardless, laughter and delighted shouts rang out across the conference grounds until nightfall marked the end of the game. Every minute of the retreat carried significant purpose, even in seemingly silly games or during down time. At every meal, after the staff had settled in their seats with their food and friends, a single staff member was asked to share their personal story. Over the course of two days, four employees shared intimate inklings of their lives while the rest listened intently. Some tears were shed, but never without the support and comfort of their audience. (From left) Adam Loesing, Pavan Mudiam and Madi Barker! Wine To Water has always valued the power of community in the field, but it is also irreplaceable in the office amongst team members. As a growing organization full of diverse individuals from different backgrounds, the value of sharing life together cannot be quantified by any statistic. With strong bonds comes an even greater impact, and we certainly dare to enter brave spaces with one another to make that possible. The Wine To Water team is excited to take what we have learned from Cross Training back to the office and field. Even more importantly, we are excited to share our legacy with you, because it is not ours alone. Thank you for being a part of our legacy.